The Partridge Family: 2200 A.D.
C’mon, get happy all over again with The Partridge Family: 2200 A.D. This half-hour Saturday morning cartoon from Hanna-Barbera was based on the popular live-action series about America’s favorite singing family (at the time, at least—no disrespect intended to The Jackson Five, The Osmonds, The Bradys, et al). This time around, The Partridges—mom Shirley and kids Keith, Laurie, Danny, Chris, and Tracy—took their act on the interstellar road, 225 years in the future. Also along for the ride was band manager and father figure Reuben Kincaid. No longer content to tour other cities, the show saw the rock and rollers touring other galaxies. In lieu of the family’s trademark psychedelic touring bus, their mode of transportation in outer space was (naturally) a psychedelic touring spaceship. It didn’t take long for the singing clan to meet up with a pair of good-humored teenaged aliens, Veenie (from Venus) and Marion (from Mars), who provided much of the show’s comic relief. Most of the hilarious plotlines revolved around science-fiction type gags, like Danny turning himself invisible or Keith shrinking in size. 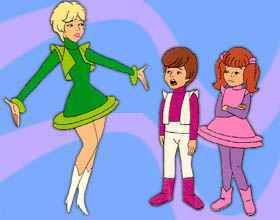 The concept for The Partridge Family: 2200 A.D. began when ABC launched another Scooby Doo-inspired series entitled Goober and the Ghost Chasers. In that show, members of the Partridge Family would appear as guest stars to help Goober, the crime-sniffing hound. It was successful enough that ABC and Hanna-Barbera decided to give the musical family their own show one year later. In 1977, Goober and the Partridges were reunited in the composite series Fred Flintstone and Friends.